Department of Pharmaceutical Sciences, School of Applied Science and Technology, University of Kashmir, Srinagar - 190006, Jammu and Kashmir, India. ABSTRACT: Losartan potassium is used to treat hypertension, and it protects the kidneys from diabetic nephropathy. The drug has a short plasma half-life, inadequate bioavailability, removed rapidly from the blood circulation. These problems can be eliminated by formulating a novel dosage form of a drug in the form of floating oral in-situ gel. Present research performed on losartan potassium drug deals with the preparation and valuation of floating oral in-situ gel of the polymers used in-situ gel formation has many benefits like the sustained effect of drug substance and prolonged action in comparison to conventional drug delivery systems and good patient compliance, good stability and biocompatibility characteristics. The objective of this study was to develop an optimized in-situ oral gel of losartan potassium suitable to be administered by an oral route which upon exposure to physiological conditions changes to the gel phase. The aim of developing in-situ gel of losartan potassium was achieved through formulation designing of various formulations using various combinations of polymers and a cross-linking agent. 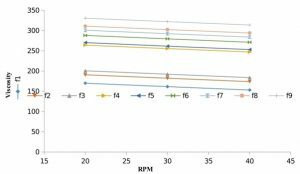 Optimization of the prepared formulations for gelling capacity and floating behavior and evaluation of optimized formulations. All the optimized in-situ gel formulations exhibited the expected viscosity, pH, in-vitro gelling capacity, in-vitro floating ability, and sustained drug release. INTRODUCTION: Losartan potassium belongs to the class of antihypertensive agents called angiotensin II receptor blockers (ARBs). After biotransformation, losartan potassium changes to its longer-acting active metabolite, E-3174. Both the drug and active metabolite are specific in their action, and selective type-1 angiotensin II receptor (AT1) antagonists block the blood pressure increasing effects of angiotensin II via the renin-angiotensin-aldosterone system (RAAS). The low bioavailability of losartan potassium is due to its incomplete absorption and extensive metabolism. Consequently, a floating type sustained-release in-situ gel formulation was developed to increase the time of the drug release and hence increase the bioavailability of the drug. Oral prolonged release drug delivery recently has been of increasing interest in the pharmaceutical field to achieve improved therapeutic benefits such as reduced dosing, patient compliance, and flexibility in formulation. In-situ gel forming systems have been broadly investigated as vehicles for prolonged drug delivery. This interest has been triggered by the benefits shown by in-situ forming polymeric delivery systems such as ease of dispensation and decreased rate of administration, better quality of patient compliance and comfort 1-4. One or combination of different stimuli like pH change, temperature modulation, and solvent exchange are utilized in in-situ gel formation 5-9. So, in-situ gels are administered by oral 10, ocular 11, rectal 12, vaginal 13, injectable 14 and intra-peritoneal route. Both natural and synthetic polymers like gellan gum, alginic acid, xyloglucan, pectin, chitosan, poly (DL-lactic acid), poly (DL-lactide-co-glycolide) and poly-caprolactone are used for formulation development of in-situ forming drug delivery systems 15. Due to the presence of bioadhesive nature of the polymer, the formed gel formed being lighter floats over the stomach contents or adheres to the gastric mucosa and produce gastric retention of the dosage form and increase gastric residence time resulting in prolonged drug delivery in the gastrointestinal tract. The present research was intended to formulate a liquid solution containing Losartan potassium that shall gel on contact with gastric juice; further the formed gel shall float and remain in the stomach for a prolonged period ensuring improved absorption of the drug. MATERIALS AND METHODS: Losartan potassium was received as a gift sample from Medley Pharmaceuticals Ltd., (Jammu). Sodium Alginate (SA), Calcium Chloride, Sodium bicarbonate, HPMC, Sodium Citrate, D-sorbitol were purchased from Central Drug House (P) Ltd. New Delhi (India). All other chemicals used in the study were of Analytical Grade. Preparation of Floating in-situ Gel: In-situ gel formulation was prepared by simply dissolving a gel-forming polymer (sodium alginate) in distilled water. A crosslinking agent (calcium carbonate) was added that upon inter and intra-polymeric crosslinking resulted in the formation of a gel. Consequently, gel-forming the polymer, sodium alginate; crosslinking agent, calcium carbonate; viscosity enhancer, HPMC and effervescent, sodium bicarbonate was added to distilled water and heated up to 60 ºC with continuous stirring using a magnetic stirrer (REMI equipment). After cooling the solution to up to 40 ºC, the drug (losartan potassium) and flavoring agent (D-sorbitol) were added. The resulting formulations were finally stored in amber colored bottles until further use 16-19. Sodium alginate solution of different concentrations containing varying amounts of calcium carbonate and other ingredients were prepared. The composition of various formulations prepared is given in Table 1. Optimization of Variables Using Full Factorial Design: A 32 randomized full factorial design was used to optimize the formulation. In this design, 2 factors were evaluated, each at 3 levels and experimental trials were performed for all 9 possible combinations. The concentration of sodium alginate (X1) and concentration of calcium chloride (X2) were chosen as independent variables in 32 full factorial design. The formulation layout for the factorial design is shown in Table 2. Rheological Studies: In this study in-vitro gelation study and viscosity measurements were conducted. The adhesiveness/viscidity of the samples was determined using a digital Brookfield viscometer (Viscolead RVD) using 5 ml aliquot of the sample with spindle number 20, 30, 40 rpm and sample temperature was maintained at 25 ºC before each measurement. In-situ solution (5 ml) of Losartan potassium and artificial simulated gastric fluid (100 ml) were mixed and gelation was observed by visual examination. In-vitro Floating Study: The in-vitro floating study was determined using USP dissolution apparatus (Bells India) having 900 ml of 0.1N HCl. The petri dish containing 10 ml of withdrawn in-situ gelling solution was immersed into dissolution apparatus at 37 ºC. The time is taken by the formulation to emerge on the medium surface, and the time the formulation constantly floated on the dissolution medium surface was noted visually. Measurement of Water Uptake by the Gel: The in-situ gels formed in 40 ml of hydrochloric acid buffer (pH 1.2) were separated. The initial weight of the gel was calculated and to this weighed gel 10ml of distilled water was added, and after every 30 minutes the water was poured off, and the final weight of gel was recorded, and the difference in the weight was calculated. In-vitro Drug Release Studies: The in-vitro release of drug from floating oral in-situ gel solutions was determined by using USP type II (paddle type) dissolution test apparatus (Bells India). Five ml from each formulation was transferred using the disposable syringe. The syringe plunger was depressed slowly to extrude 5 ml into a petri dish having an internal diameter of 4.5 cm already containing 10ml of 0.1 N HCl. The petri dish was then placed on the surface of the dissolution medium and plunged into a dissolution vessel containing 900 ml of 0.1 N HCl (pH 1.2) without much disturbance. The dissolution test apparatus was run at 50 rpm for 10 h at temperature 37 ± 0.5 °C. Five ml samples were withdrawn from dissolution medium at predetermined time intervals of 1, 2, 3, 4, 5, 6, 7, 8, 9, 10 h and replaced with 5 ml of pre-warmed fresh medium. Samples were filtered using Whatman filter paper no. 41 and drug contents in the aliquots was determined spectrophotometrically using double beam UV-Visible spectrophotometer (Shimadzu 1650 pc-Japan) at a λ max = 207 nm after suitable dilution. Drug-Excipient Interaction Studies: To ascertain that no interaction has occurred between the drug and the polymer or due to conditions of the formulation process, the following interaction studies were carried out. UV Spectral Analysis: UV spectrum of the drug-excipient blend was compared with the UV spectrum of the pure drug. No change in λ max was observed Fig. 1 and Fig. 2. Fourier Transform Infrared Spectroscopic Studies: Compatibility between the drug and polymers was studied by FT-IR method. Pure Losartan potassium and the formulations prepared were subjected for FT-IR spectroscopic analysis, to establish an interaction between the drug and polymers used. The position of characteristic peaks of pure Losartan potassium was compared with those peaks obtained for formulation. These characteristic bands for Losartan potassium were identifiable, and there was no significant shift or disappearance in the peak positions. This indicated that the drug was intact and has not reacted with the excipients used in the formulation and hence they are compatible. Therefore, it can be concluded that the drug is in free-state and can release easily from the polymeric network in the free form Fig. 3 and Fig. 4. DSC: To further establish the purity of the drug differential scanning calorimetry was performed. The DSC scan is shown in Fig. 5 and reference scan in Fig. 6. Visual Appearance and Clarity: Clarity is one of the most important characteristic features of in-situ gel formulations. The prepared formulations were examined for appearance and clarity by visual observation against a white and black background to check the presence of any particulate matter. The physical appearances of all the developed formulations were off white and were clear. All the developed gels showed good homogeneity with the absence of lumps Table 3.
pH: Measurement of pH is essential for oral preparations; otherwise it leads to irritation to the throat. To ensure that the preparation has alkaline pH, the pH of the prepared in-situ gelling system after the addition of all the ingredients was measured using digital pH meter. This was previously calibrated by pH 4 and pH 7. The pH values were recorded immediately after preparation. The formulations possessed satisfactory pH value ranging from 7.5 to 8.5 Table 4 which is suitable to maintain the formulations in a liquid state. Aqueous solutions of sodium alginate are most stable at pH range of 4-10. Below pH 3, alginic acid is precipitated from the alginate solution making the formulation unsightly containing gel and liquid phases. Drug Content Uniformity: To ensure the uniform release of drug from the formulation, drug content uniformity in the formulation. 5 ml of liquid solution from all formulations was taken, and 70 ml of 0.1 N HCl was added after that sample was sonicated for 30 min until a clear solution obtained. The volume was diluted to 100 ml and filtered using Whatman filter paper no. 41. 1 ml sample was withdrawn from the prepared solution and diluted to 10 ml with 0.1 N HCl. Contents of losartan potassium were determined spectrophotometrically using double beam UV-Visible spectrophotometer (Shimadzu 1650 pc-Japan) at λ max= 207 nm 13 Table 5. 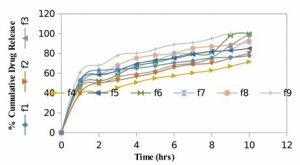 In-vitro Gelling Capacity: The in-vitro gelling capacity of prepared formulations was measured by placing 5 ml of the gelation solution (0.1N HCl, pH 1.2) in a 15 ml borosilicate glass test tube and maintained at 37 ± 1ºC temperature. As the solution comes in contact with gelatin solution, it was immediately converted into a stiff gel-like structure. The gelling capacity of the solution was evaluated by the stiffness of formed gel and period for which the formed gel remains as such. The in-vitro gelling was graded in three categories by gelation time and the period for which the formed gel remains 5. The sodium alginate concentration 0.5%, 1% w/v retained liquid state (free flow) at temperature 25ºC and gel upon exposure to physiological conditions (0.1N HCl). The concentration 1.5% w/v also retained liquid state at temperature 25 ºC and gelled upon exposure to physiological conditions, but it was not stable and dissolved rapidly. However, the solutions of 2% w/v, 2.5% w/v and 3% w/v retained liquid state (free flow) at pH 6.0 and 25 °C and gelled upon exposure to physiological conditions. By in-vitro gelling capacity and pourability, sodium alginate concentration was fixed at 2.5% w/v, and this was used for further study. Increasing concentration of CaCl2 significantly increased gel strength and decreases gelation time due to increase in gel rigidness as the degree of crosslinking of divalent Ca2+ ions with the polymer chains increases and thus causing gelation to undergo instantly. By visual observation, floating lag time and gelation, the working concentration of CaCl2 was fixed at 0.125% w/v Table 6. Floating Behavior: The floating lag time and duration of floating time of in-situ gels were studied. The in-vitro floating study was carried out using 900 ml of 0.1N HCl, (pH 1.2) maintained at 37 ºC. 10 ml formulation was introduced into the dissolution vessel containing medium without disturbance. When the formulation is placed in the medium, the CO2 released from the formulation was entrapped in the gel network producing buoyant formulation. Further, calcium ion reacted with sodium alginate produced a crosslinked 3-D gel network which swelled and entrapped with more CO2. This entrapment in the network structure caused the buoyancy and flotation for an extended period. Further, the gel network retarded the drug release and thus exhibiting sustained release pattern. All the formulations exhibited a very short floating lag time Fig. 7. 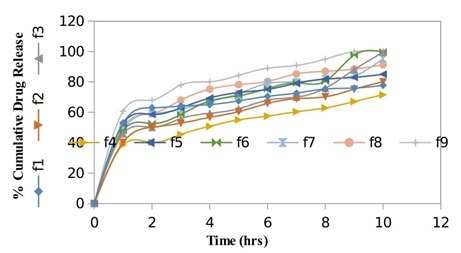 Table 7 shows floating time and floating lag times of in-situ gel formulations. Rheological Studies: The two main pre-requisites of in-situ gelling systems are optimum viscosity (to ingest orally as a liquid dosage form) and gelling capacity (speed and extent of gelation). Viscosity determination was done for all the formulations using Brookfield viscometer at 3 different rpm (20, 30 & 40 rpm) using spindle no. 8 at 25 °C. From the observations, it was noticed that there was an in an increase in viscosity with an increase in the concentration of sodium alginate. This increase in viscosity can be attributed to a consequence of increasing chain interaction with polymer concentration. Increasing the calcium chloride content in the formulation simultaneously increased the viscosity at all polymer concentrations studied. Since, the calcium chloride is present as insoluble dispersion in the formulations, an increase in its concentration proportionally increased the number of particles dispersed, thus contributing to the increased viscosity Table 8, Fig. 8. Measurement of Water Uptake: Release of the drug from the polymer matrix depends on the amount of water associated with the system. The release of the drug may involve the penetration of water into the matrix and simultaneous release of the drug via diffusion or dissolution. The water associated with the formulation at any point in the time can be determined by the thermos-gravimetric analyzer, but in this present study, a simple test was done for the in-situ gel formulations. The results of the water uptake study are given in Table 9, Fig. 9. In-vitro Drug Release Studies: The in-vitro release of losartan potassium from buoyant in-situ gel solutions was studied by using USP type II (paddle type) dissolution test apparatus. Five ml from each formulation was transferred using the disposable syringe. The syringe plunger depressed slowly to extrude 5 ml into a Petri dish with an internal diameter of 4.5 cm already containing 10ml of 0.1 N HCl. This Petri dish containing formulation was placed on the surface of the medium and plunged into a dissolution vessel containing 900 ml of 0.1 N HCl (pH 1.2) without much disturbance. The dissolution test apparatus was run at 50 rpm for 10 h at temperature 37 ± 0.5 °C. Five ml samples were withdrawn from dissolution medium at predetermined time intervals of 1, 2, 3, 4, 5, 6, 7, 8, 9, 10 h and replenished with 5 ml of pre-warmed fresh medium. Samples were filtered using Whatman filter paper no. 41 and drug contents in the aliquots was determined spectrophotometrically using double beam UV-Visible spectrophotometer (Shimadzu 1650 pc-Japan) at a λ max = 207 nm after suitable dilution. 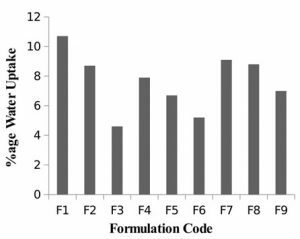 The release profile of formulations indicated that the formulations F3, F6, and F9 showed better results amongst all formulations. 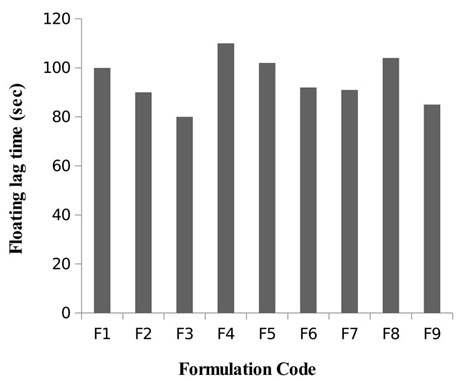 The cumulative percentage release from these nine formulations was found to be in between 50.17% to 99.69%. 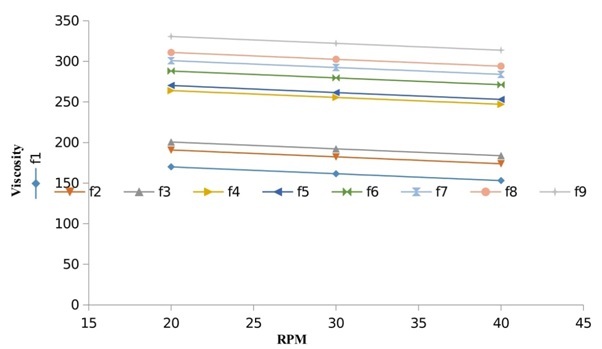 The results indicate that drug release was significantly prolonged by using the in-situ gelling system containing polymers sodium alginate, HPMC and cross-linking agent calcium chloride Table 10 and Fig. 10. Kinetics of Drug Release: To analyse the mechanism of drug release, the in vitro dissolution data of the formulations prepared with the help of factorial design were fitted to mathematical models, Zero Order (Chen and Hao, 1998), First Order (Shah, 1987), Higuchi release model (Higuchi, 1961), and Korsmeyer Peppas model (Korsmeyer, 1983). From the in-vitro drug release data the order of the goodness of the fit “R2 values” and n values were found to be in the order as: zero order > Ist order > Higuchi for all the three formulations F3, F6 and F9. “n” values were found to 0.359, 0.593 and 0.287 respectively Table 11, 12 and 13. Stability Studies: The objective of stability studies was to predict the shelf life of a product by accelerating the rate of decomposition, preferably by increasing the temperature and relative humidity. The stability studies for optimized formulation F3 was carried out at 25 ± 5 ºC / 60 ± 5% RH and 30 ± 5 ºC / 65 ± 5% RH as long term and intermediate storage conditions for a period of 3 months (0, 1, 2 and 3 months sampling). To assess stability, these samples were analyzed and checked for changes in physical appearance and drug content at regular intervals. The obtained data is presented in Table 14. The results indicated that the formulation F3 did not undergo any major chemical change/interaction during the study period. There was no marked change in the physical properties and drug content during the study period, which indicated that formulation F3 exhibited good stability during the investigation period. CONCLUSION: The in-situ gel containing losartan potassium was successfully prepared. The in-situ formed gel preserved its integrity without dissolving or eroding for a prolonged period to facilitate sustained release of drugs. The formulation met all prerequisites to become an in-situ gelling floating system that gelled and floated instantaneously in the pH conditions of the stomach. It was observed that the resulting gel remained buoyant for 24 h and slowly released Losartan potassium during the 10 h period. It is concluded that Losartan potassium could be targeted to the stomach and be released slowly over some time. Peppas N and Langer R: New challenges in biomaterials Science 1994; 171-520. Miyazaki S, Endo K, Kawasaki N, Kubo W, Watanabe H and Attwood D: Oral sustained delivery of paracetamol from in-situ gelling xyloglucan formulations. Drug Dev Ind Pharm 2003; 113-119. Sarasija S and Shyamala B: Nasal Drug Delivery: An Overview. Indian J Pharm Sci 2005; 1925. Rozier A, Mazuel C, Grove J and Gelrite PB: A novel, ion-activated, in-situ gelling polymer for ophthalmic vehicles. Effect on the bioavailability of timolol. Int J Pharm 1989; 163-168. Cohen S, Lobel E, Trevgoda A and Peled Y: A novel in-situ-forming ophthalmic drug delivery system from alginates undergoing gelation in the eye. J Control. Release 1997; 201-208. Srividya B, Cardoza RM and Amin PD: Sustained ophthalmic delivery of ofloxacin from a pH-triggered in-situ gelling system. J. Control Release 2001; 205-211. Miyazaki S, Kawasaki N, Endo K and Attwood D: Oral sustained delivery of theophylline from thermally reversible xyloglucan gels in rabbits. J Pharm Pharmacol 2001; 1185-1191. Miyazaki S, Suzuki S, Kawasaki N, Endo K, Takahashi A and Attwood D: In-situ gelling xyloglucan formulations for sustained release ocular delivery of pilocarpine hydrochloride. Int J Pharm 2001; 29-36. Miyazaki S, Suisha F, Kawasaki N, Shirakawa M, Yamatoya K and Attwood D: Thermally reversible xyloglucan gels as vehicles for rectal drug delivery. J Control Release 1998; 75-83. Singh UV, Udupa N, Kamath R and Umadevi P: Enhanced Biodegradable in-situ forming implants and methods of antitumor efficacy of methotrexate poly (lactic-co-glycolic) producing the same, US Pat. 4938763, 3 July 1990. Suisha F, Kawasaki N, Miyazaki S, Shirakawa M, Yamatoya K, Sasaki M and Attwood D: Xyloglucan gels as sustained release vehicles for the intraperitoneal administration of mitomycin C. Int J Pharm 1998; 27-32. Wataru K, Yasuhiro K, Miyazaki S and Attwood D: In-situ gelling pectin formulations for oral sustained delivery of paracetamol. Drug Develop Ind Pharm 2004; 593-9. Ganapati R, Bhimagoni SK and Anegundha S: Floating drug delivery of a locally acting H2-antagonist. An approach using an in-situ gelling liquid formulation. Acta Pharm 2009; 345-354. Shah S, Upadhyay P, Parikh D and Shah J: In-situ gel: A novel approach of gastroretentive drug delivery. Asian J Biomed Pharm Sci 2012; 01-8. Itoh K, Yahaba M, Takahashi A, Tsuruya R, Miyazaki S and Dairaku M: In-situ gelling xyloglucan/pectin formulations for oral sustained drug delivery. Int J Pharm 2008; 95-101. Miyazaki S, Kubo W and Attwood D: Oral sustained delivery of theophylline using in-situ gelation of sodium alginate. J Control Release 2000; 275-80. Miyazaki S, Aoyama H, Kawasaki N, Kubo W and Attwood D: In-situ-gelling gellan formulations as vehicles for oral drug delivery. J Control Release 1999; 287-95. Kadam VJ and Shidhaye SS: Sustained release is floating drug delivery system of in-situ gelling suspension of cinnarizine. J Pharm Res 2009; 449-54. Remya PN, Damodharan N and Venkata MA: Oral sustained delivery of ranitidine from the in-situ gelling sodium-alginate formulation. 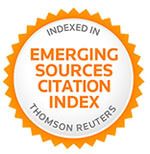 Journal of Chemical and Pharmaceutical Research 2011; 814. Deshpande A, Rhodes C, Shah N and Malick A: Controlled release drug delivery systems for prolonged gastric residence: An overview. Drug Dev Ind Pharm 1996; 531-9. Costa P and Sousa Lobo JM: Modeling and comparison of dissolution profiles. Eur J Pharm Sci 2001; 123-33. Tjandrawinata RR, Setiawati E, Putri RS, Gunawan VA, Ong F and Susanto LW: Pharmacokinetic equivalence study of two formulations of the anticonvulsant pregabalin. Clin Pharmacology 2015; 69-75. Patel DM, Patel DK and Patel CN: Formulation and evaluation of floating oral in-situ gelling system of amoxicillin. 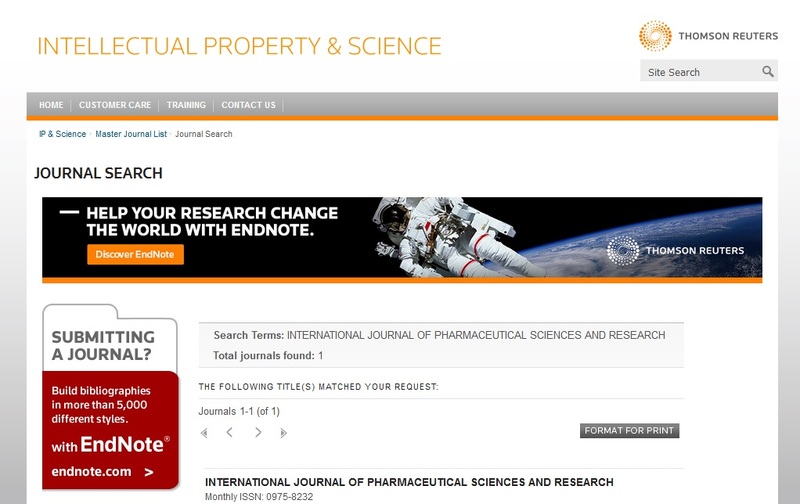 Journal of Chemical and Pharmaceutical Research 2011. Bashir R, Raza SN, Kawoosa S, Wani TU and Khan NA: Formulation and evaluation of floating oral in-situ gelling system of losartan potassium. Int J Pharm Sci & Res 2019; 10(4): 2045-53. doi: 10.13040/IJPSR.0975-8232.10(4).2045-53.